The Hero's Trail by T. A. Barron. 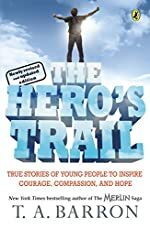 Review: If you're looking for a book about hardships that did not end in failure, then, The Hero's Trail by T.A. Barron is a perfect choice. It is about how people with diseases and just other problems in general don't let them give up. Even though them may be faced with ridicule, they showed determination. In The Hero's Trail, it shows that someone with polio even turned out to be one of the fastest people in the worldÉmaybe even the fastest! Wilma Rudolph had polio, and she could walk and run like other kids did, unlike other people with polio. Soon she broke records and became the fastest woman in the world! But not all of the stories in this book are all about having a disease. The Hero's Trail is also about a man named Glenn Cunningham had been scorched by an old stove, and his legs were seriously scorched leaving almost no muscle remaining! The family and especially Glenn prayed that he would be able to walk and run again. He slowly felt feeling around his legs. He moved his toes and his knees. And soon he was walking around his room. Then he started breaking records. All of them were determined to keep on going. There are even more people in the book like, Sherwin Long and many other people that fought through. This book should be told to everyone, in every age. But some of the vocabulary may be challenging for younger readers. But otherwise, this book is amazing. It has crazy stories of one of the most famous people ever! And they may have had things happen to them that you never knew about. But they fought through. And that is what I admire most about these people. And that is what I think that I what the author (T.A. Barron) is trying to get across: to determinate. Determination got them through their hardships. And Glenn Cunningham prayed to get better. And that is what I think is the best type of determination there is. And ever was! All of the people in this book wanted to conquer what had happened; and they did! Just with determination. They did anything they could in their power to fix it. I also love how some of the people didn't care what other people thought of him or her. They knew they were amazing. They knew they would conquer the disease and/or problem. And they did. This book is as amazing as the people in it. Buy it or check it out at your local library and enjoy! We would like to thank T. A. Barron for providing a copy of The Hero's Trail for this review. Have you read The Hero's Trail? How would you rate it?